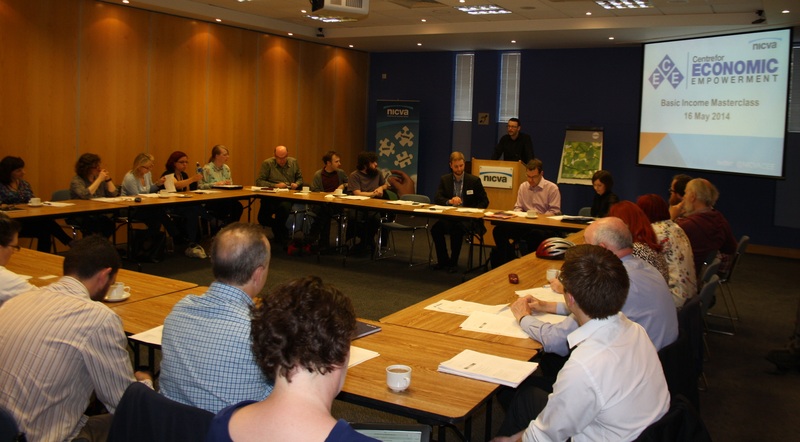 NICVA's first Masterclass of 2014 examined the idea of a Basic Income. This would replace the current system of social security with a standard, regular payment for all citizens. Micheál Collins, Senior Research Officer with the Nevin Economic Research Institute, discussed the practicalities of a Basic Income, including what level it could be set at and how it could be funded. "There is a clear need to consider alternative models of social security. The current system was designed for a different time. It is highly complex and bureaucratic, it is based on a stigmatising distinction between the deserving and undeserving poor, and it is losing public support. However, the government's Welfare Reforms are unlikely to help. They aim to ensure that only work, not welfare provides an adequate level of income. But with much work flexible and insecure, and with low-pay prevalent, work does not always provide a decent standard of living. In this context interest in the idea of a Basic Income is growing around the world. Today was about getting that conversation going in Northern Ireland." Eoin Rooney, Micheál Collins and Maureen O'Reilly give their views on a basic income.